Most of you know me from my 9 years of blogging/citizen journalism and activism at Pam's House Blend . That was a labor of love, I did it for the greater good -- equality for all, but it never really paid the bills. I had to stop the Blend because rheumatoid arthritis felled me -- I couldn't keep up the pace of blogging/reporting -- so I needed to focus on holding down the day job at Duke University Press, where I held several positions over 22 years and I left a mark that I am proud of. I never imagined I would need to do this, having been a self-sufficient person all my burning-the-candle-at-both-ends working adult life. But like many out there, disability from chronic illness - and now additionally in the form of spine deterioration -- a collapsed disc at L5-S1, made me exhaust my Family Medical Leave Act unpaid time off of 12 weeks of job protection we have under federal law. However this brings me back to why this campaign is necessary - when FMLA is exhausted, your employer is under no obligation to keep you on. And lo and behold, the day after it was exhausted, I was notified by email that I was terminated from my unit and my position was to be filled ASAP. A request to extend job protection under the Americans With Disabilities Act had been declined by my unit. They were moving on. So, I am unexpectedly left without a job. Yep, 22 years of service, only a few away from being able to retire, a career snuffed out. It's the disposable economy at work, perfectly legal. To make matters worse, I was told that I owed them more than $3000 because of a payroll paperwork matter of overpayment. A parting gift. So, turns out, I do need funds fairly soon because I'm not very liquid these days. It’s hard for me to ask for help, so instead, I’m thinking about this as asking fans of The Blend to hit the tip jar for those nine years of writing and blogging (putting it that way helps me feel better about it) -- You’re help is greatly appreciated. Thankfully, I have always paid my bills on time and have always lived small - I can live much smaller and thrive. But nowadays it's just me and the two dogs, so it's a very real possibility I will have to sell my house and move because of this turn of events. Not a lot of time to make decisions as funds dry up. Your generosity will allow me a bit of time to get my affairs in order while physically rehabbing to the extent I can...especially if I need to move a good distance. I am currently not medically cleared to work (not sure that I will be, I am undergoing PT to find out (that is also costing $ even with insurance). Getting federal disability takes years and often you are turned down more than once - even though I have clearly documented medical conditions that are life restricting. But my mind is sound, my life is not over at 52, no matter what my employer tells me. Even with these disabilities, I am not disposable. The Panda will rise again. Thank you all. Your readership over the years, the friendships, it all means a great deal to me. It's hard to come up with enough thoughtful ways to thank you all, so I recorded a short video today. No script, just off-the-cuff, from the car of all places (easy on wrists to hold the phone). As I said a few weeks ago, we often discuss the sorry state of humanity here -- about the violence, greed, the lack of empathy. It can make you want to give up at times. But this campaign reminds me of the goodness in people out there, whether we've met in person, or in virtual space. What we can all do is work toward a more humane workplace than what I've experienced in being let go after 22 years at Duke University Press when my FMLA ran out. And we need to work toward more compassionate governance generally - what can you say when you see the lack of common sense and reason going on in NC right now? We can be better than examples set like this. But you all show that we are. Remember to go to the polls, please. And advocate for your rights. 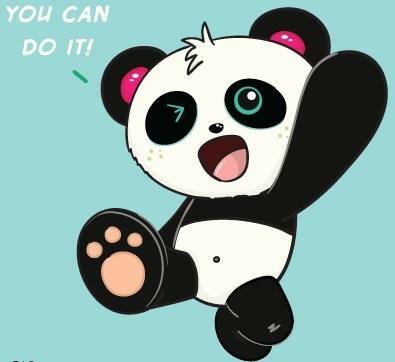 --Panda out, with much gratitude! I am not disposable... or disappearing. 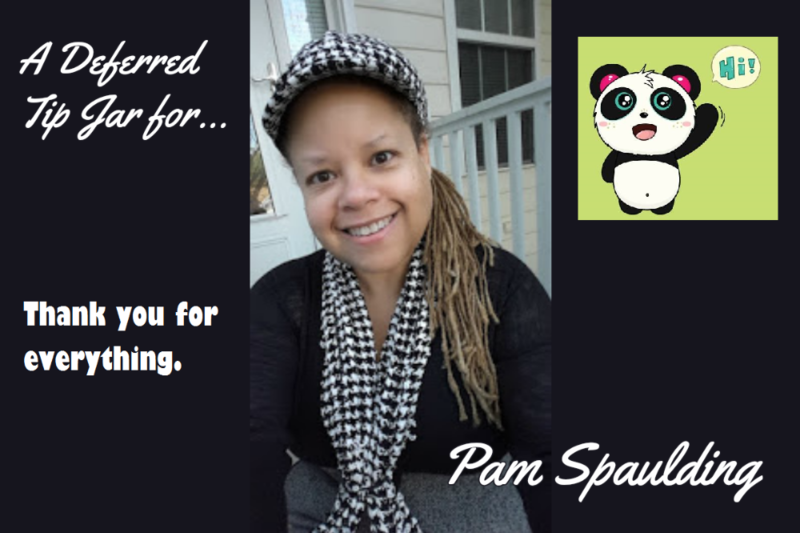 Thank you from The Panda! Hello, all! It's been a few days since an update. I am still navigating medical visits and paperwork dealing with the life-changing dump from my 22-year career at Duke University Press when my 12 weeks of FMLA expired (recapped here: http://goo.gl/vKZ9xv). I had another sciatic flare that took me out over the weekend, but I'm hanging in. In the 10 days since the GoFundMe launch, the kindness and generosity of so many of you -- in donations and in private messages and in public comments -- it all has been amazing. I'm now jumping through more administrative hoops. But thanks to you all, I will be able to wrap things up to start over. It will be a huge task full of unknowns with this collapsed disc, but I know I will land on my feet thanks to you. 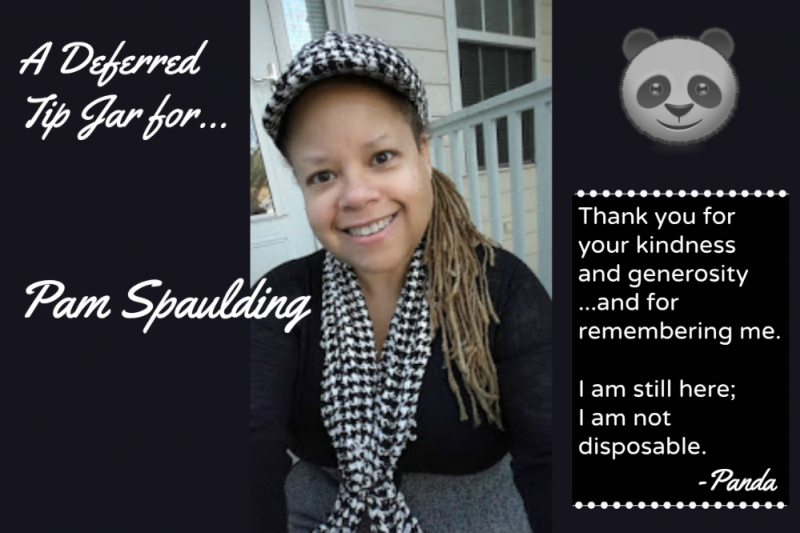 Update from a grateful Panda! I'm still receiving many messages from people -- former co-workers at Duke Press, friends from the equality movement, fellow journalists (indy and mainstream), readers of Pam's House Blend -- and a good number of people who have dealt with being "disposed" by their employer because their FMLA 12 weeks ran out due to illness, disability, or for family caregiving. No one is disposable, to be used up and tossed away -- sending years of loyal service down the drain. It definitely is a humbling, life-changing experience, but it gives me perspective. It motivates me to be more, do more as my body allows. Your generosity and your kind words of support have lifted my spirits so much. The notes conveying how much my writing and activism on The Blend meant to you make me proud and happy that I gave that much of myself for equality at a critical time, during what someone said to me was "the golden age" of political blogging. I had a good run and closed the blog when it was time. Certainly with less upheaval than my 22-year run at Duke Press that came to an abrupt and pretty disheartening end. But it's time for the next chapter, ready or not. You are helping me get ready for that uncertain journey...many thanks. $23,880! 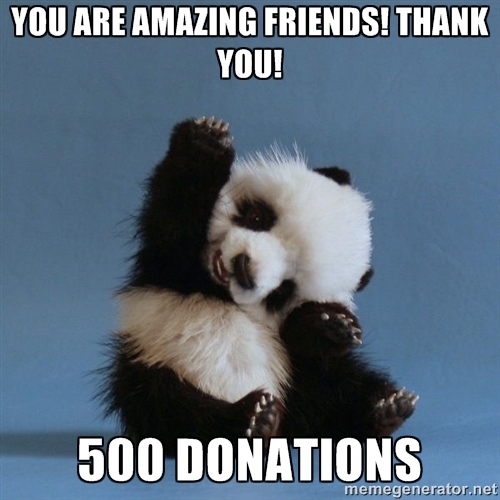 That is the total from 500 amazing friends of #TeamPanda as of this AM. I set an original goal of $6000, never expecting make that a few days ago, let alone blowing past that the first day in response to my firing by my employer, Duke University Press, tossed after 22 dedicated years there when my FMLA ran out. Many of you cited my nine years of work on Pam's House Blend as the reason for pitching in to help your former blogmistress. Others identified with my day job hat, and a different set of generous people mentioned how they were similarly treated as disposable when disability (or need to be a caregiver) changed the view of management. "I never imagined I would need to do this, having been a self-sufficient person all my burning-the-candle-at-both-ends working adult life. But like many out there, disability from chronic illness - and now additionally in the form of spine deterioration -- a collapsed disc at L5-S1, made me exhaust my Family Medical Leave Act unpaid time off of 12 weeks of job protection we have under federal law. However this brings me back to why this campaign is necessary - when FMLA is exhausted, your employer is under no obligation to keep you on. And lo and behold, the day after it was exhausted, I was notified by email that I was terminated from my unit and my position was to be filled ASAP. A request to extend job protection under the Americans With Disabilities Act had been declined by my unit. They were moving on. So, I am unexpectedly left without a job. Yep, 22 years of service, only a few away from being able to retire, a career snuffed out. It's the disposable economy at work, perfectly legal. To make matters worse, I was told that I owed them more than $3000 because of a payroll paperwork matter of overpayment. A parting gift." You need to see a good neurosurgeon. I have similar problem only a little more complicated. It IS FIXABLE. YOU did this, Pam! All those years of blogging, letting the world know what's going on, being a resource for newly out (or newly out to themselves) LGBTQ people...you've earned this. I'm just happy to be able to repay in a small way all the help you gave me. Thank you. I am LOVING watching this happen. All the feels! I'm loving watching this. You deserve it, and obviously people agree with me. Anyone reading: remember, GFM takes 8%... Let's make sure it's 8% of a huge amount. We all owe you so much, Pam. If we survive to write the history, you'll be known. 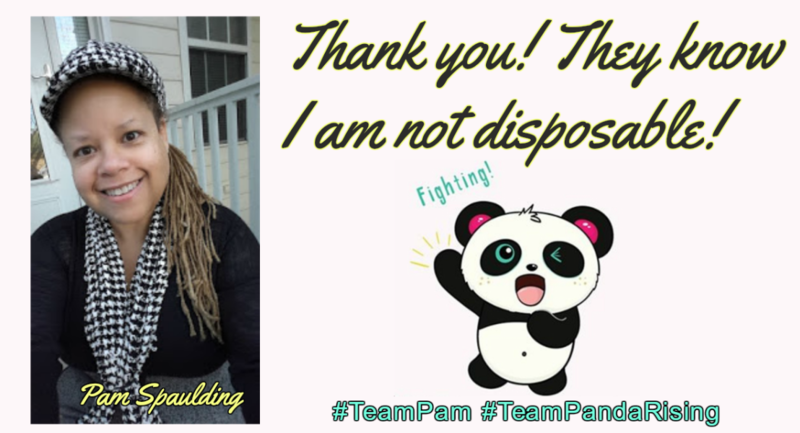 Love you Pam! So sorry this is happening. thanks for your amazing blog, and good luck to you.